Over the past 40 years, microelectronics have advanced by leaps and bounds thanks to silicon and complementary metal-oxide semiconductor (CMOS) technology, enabling computing, smartphones, compact and low-cost digital cameras, as well as most of the electronic gadgets we rely on today. However, the diversification of this platform into applications other than microcircuits and visible light cameras has been impeded by the difficulty of combining non-silicon semiconductors with CMOS. ICFO researchers have now overcome this obstacle, showing for the first time the monolithic integration of a CMOS integrated circuit with graphene, resulting in a high-resolution image sensor consisting of hundreds of thousands of photodetectors based on graphene and quantum dots (QD). They incorporated it into a digital camera that is highly sensitive to UV, visible and infrared light simultaneously. This has never before been achieved with existing imaging sensors. In general, this demonstration of monolithic integration of graphene with CMOS enables a wide range of optoelectronic applications, such as low-power optical data communications and compact and ultra sensitive sensing systems. The study was published in Nature Photonics, and highlighted on the front cover image. The work was carried out by ICFO in collaboration with the company Graphenea. The graphene-QD image sensor was fabricated by taking PbS colloidal quantum dots, depositing them onto the CVD graphene and subsequently depositing this hybrid system onto a CMOS wafer with image sensor dies and a read-out circuit. As Stijn Goossens comments, "No complex material processing or growth processes were required to achieve this graphene-quantum dot CMOS image sensor. It proved easy and cheap to fabricate at room temperature and under ambient conditions, which signifies a considerable decrease in production costs. Furthermore, because of its properties, it can be easily integrated on flexible substrates as well as CMOS-type integrated circuits." "We engineered the QDs to extend to the short infrared range of the spectrum (1100-1900nm), to a point where we were able to demonstrate and detect the night glow of the atmosphere on a dark and clear sky enabling passive night vision. This work shows that this class of phototransistors may be the way to go for high sensitivity, low-cost, infrared image sensors operating at room temperature addressing the huge infrared market that is currently thirsty for cheap technologies," says Goossens. 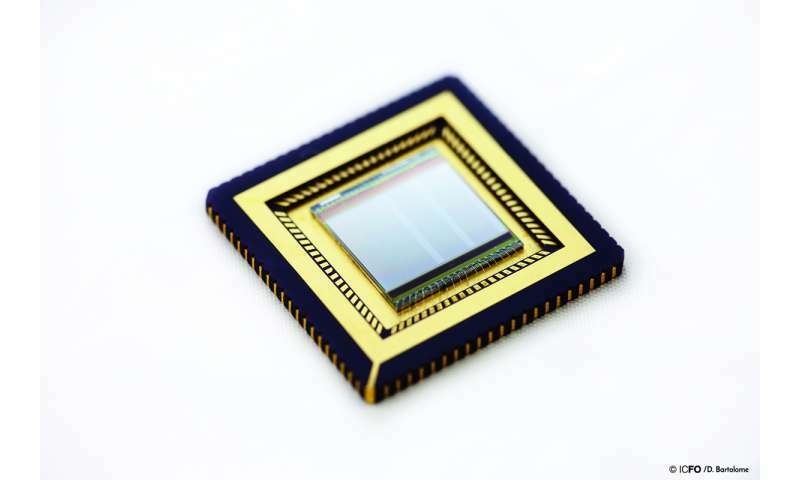 "The development of this monolithic CMOS-based image sensor represents a milestone for low-cost, high-resolution broadband and hyperspectral imaging systems," says ICREA Professor Frank Koppens. He says that "in general, graphene-CMOS technology will enable a vast number of applications that range from safety, security, low-cost pocket and smartphone cameras, fire control systems, passive night vision and night surveillance cameras, automotive sensor systems, medical imaging applications, food and pharmaceutical inspection to environmental monitoring, to name a few."